Low prices. OrangeSmile.com offers car hire service in Qatar on the lowest-rate-guarantee basis, since we work with car suppliers directly. For your search criteria in Qatar, we always select and show the best rental offers. The car reservation process consists of 3 simple steps: (1) search for available cars for your dates in Qatar; (2) select your car type; and (3) fill in the booking forms. Once the reservation is completed, you will receive a confirmation voucher to your email address. During the booking process, please check your rental conditions. To pick up your car at the rental point in Qatar, you need to provide our confirmation voucher, your driving license and a valid credit card. The final payment is normally carried out at the pick-up point. Our car hire points in Qatar accept VISA, MasterCard, etc - please check your rental conditions. At the pick-up point, please read the handling manual and check the car for present defects. 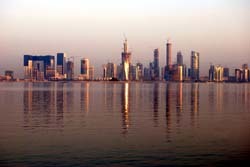 OrangeSmile.com wishes you a pleasant journey to Qatar! The car hire reservation system OrangeSmile.com allows renting a vehicle in Qatar within 10 minutes. Our largest database of car suppliers enables us to provide you a rental car in Qatar at the cheapest rate ever possible. At rental locations in Qatar we offer the following car sizes: mini, compact, economy, standard, premium and luxury. The following car types are available in Qatar: Sedan, Hatchback, Jeep, Cabriolet, Coupe, Minivan and Minibus. Tourists will find many interesting architectural landmarks in the capital of the country. In Doha, you will find Fort Doha, City Center Doha, the House of Government, popular shopping centers Hyatt Plaza and Landmark, a zoo, an aquarium, as well as numerous entertainment parks and bazaars. Besides walks in interesting markets, entertainment centers and restaurants, travelers are recommended to visit numerous museums of Doha. The National Museum of Qatar remains the biggest museum in the city. It is open in the luxurious palace that once belonged to Sheikh Abdullah bin Mohammed. A giant two level aquarium is considered the heart of the exposition. Here visitors can see the underwater world in its splendor. Other halls of the museum are dedicated to marine explorations, scientific discoveries, latest findings of archaeology and astronomy. The Museum of Weapons also exhibits or a large collection of precious artifacts. All the items are from the private collection of Sheikh. In the museum you will see items brought from different parts of the world. The collection of the Ethnographic Museum is no less interesting. Here visitors will see different household items, national costumes, work tools and crafts made by skillful local masters. It is worth mentioning that all the museums were open in old buildings that were constructed several hundred years ago. Please note that the daily rental rate in Qatar decreases with increase of the rental period. For example, a golf-class for eight days will cost just slightly more than a 7-day rental. The 'collision damage waiver' (CDW) insurance package, which protects you financially in case of a crash or an accident, is already included in all our rental offers for Qatar.